Many of you know that I am a musical theatre student, and part of that involves performing in shows frequently. My most recent production was a musical adaptation of the novel 'The Wind in the Willows'. This was a very exciting project to be a part of, because the company I was with were the first in the north to have the rights to this show after it came off the West End. In this show, I was playing a squirrel for the first act, and the Gaoler's Daughter in the second. 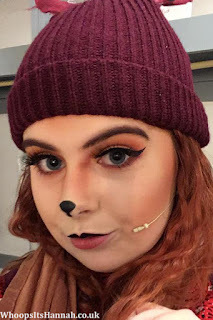 The Gaoler's Daughter in our production was a cat, which was lovely for a cray cat lady like myself to play! I wanted to show you the makeup look I came up with for this show, as something a little bit different for my blog. It is H E A V Y.
I applied moisturiser to begin with. My favourite is The Body Shop's Vitamin E day time moisturiser. After allowing that to sink in a bit, I applied two primers; one was a blurring primer to smooth my pores and fine lines, and another was a tackier primer that helps my makeup to stay on well. Following that, I used the Urban Decay All Nighter Foundation. I don't use this outside of shows, because I find that it oxidises really badly and can look rather cakey if you are heavy handed. However, the coverage is fantastic and it lasts really well, so it is perfect to wear for shows. On my undereyes and any skin imperfections, I used the Kat Von D Lock It concealer. That is a product I adore. It's high coverage, doesn't oxidise, and looks flawless every time. Perfection! To set that in place, I used a loose powder to bake my undereyes, smile lines, and my forehead. I then used a heck of a lot of pressed powder all over my face. 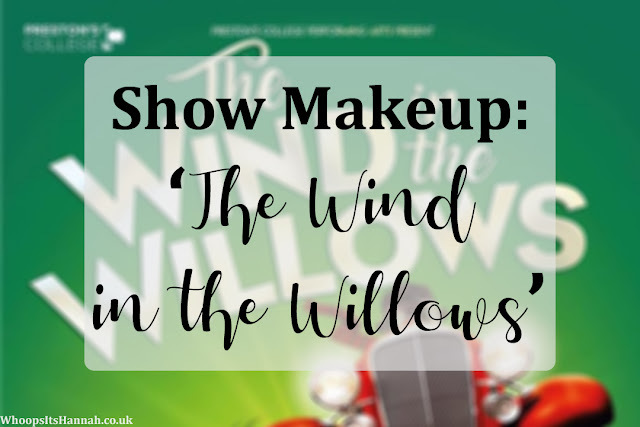 When you're onstage, you sweat a lot, and it's important to use powder to keep your makeup in place and to avoid looking too shiny. Basic makeup complete, I moved onto my eyebrows. Since I was playing animals, I was able to go a bit more dramatic and bushy than I would normally. I used my ABH Dipbrow Pomade, set my hairs in place using a clear mascara, and finally used the ABH Brow Gel to add more definition to my hairs. I'm normally very careful with this stuff, because it's very pigmented and can get messy, but for this purpose I was very relaxed with my application and allowed it to go where it wanted. The hair-like bristles led to a hairier look to the brows - perfect for a squirrel and a cat. One of my favourite parts for this look was the contour and shading I did on my face. When I'd finishde my brows, I brushed away the loose powder, and used my Morphe 35F and 35OS palettes to create orange contour all over my face. I laid out the basic shapes with a yellow shade, and then worked into it with oranges and reds for a more dramatic look. I'm a redhead, so I was playing a red squirrel and a ginger cat, so these oranges were perfect for the look. I made sure to blend thoroughly, and I was thrilled with the result of this - I thought it looked really cool. Moving onto the eyes, I laid down a base of my Urban Decay Primer Potion, which I couldn't do without. 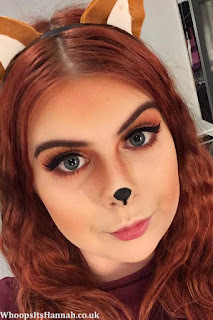 I then went into the same palettes I used for my contour, and did an orange and red smokey eye. I was able to go nice and dramatic with this, since it was for onstage, which is something I love doing. I did thick winged eyeliner for that 'cat eye' effect, and added black pencil liner to my waterline for definition. I then added some fluttery falsies and a generous coating of mascara. Finally came the animal details. I used a black shade from the red solid lipstick you can get online at Lush, and carefully painted an animal shaped nose for myself. I then used a matte black eyeshadow to set it in place so it wouldn't smudge. For my lips, I applied a light layer of Vaseline so I didn't die, then used the same black lipstick on my top lip only and set it with the eyeshadow as well. After a generous spritz of setting spray, my makeup was complete and I was ready to put on my microphone and get onstage! Thank you so much! We've all had to rock some blue eyeshadow and red lipstick haha, it's not the best but apparently we look good onstage!